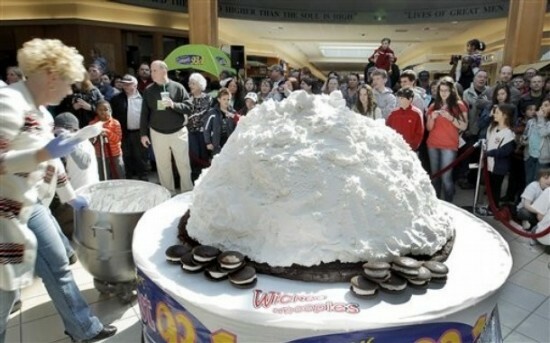 In an attempt to raise money for charity and claim the title for the world’s largest whoopie pie, a team of Maine confectioners have created a frosted dessert weighing over 1,000 pounds. They say the Amish invented the simple but delicious whoopie pie, but that didn’t stop the state of Maine from trying to claim it as its official dessert. 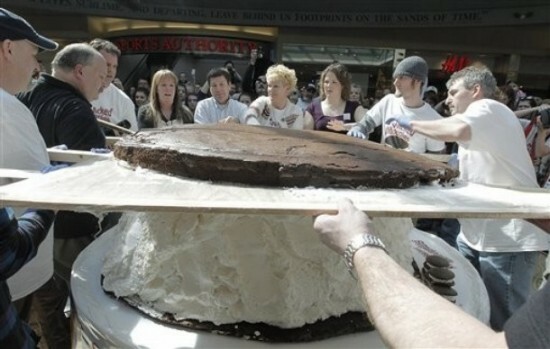 Back in September 2010, at the annual festival of Lancaster County, Pennsylvania confectioners made a 250 pound whoopie pie, but that record was practically pulverized last Saturday, when Maine managed to top it with their own giant whoopie treat, weighing 1,062 pounds. Local pie makers Wicked Whoopies provided the necessary ingredients for creating the giant calorie bomb, and assembly began around 8 am. After hours of work, which included lifting the baked top and bottom with a forklift, the drooling crowd gathered in front of Coast 93.1 radio station could finally stuff their face with frosted goodness. 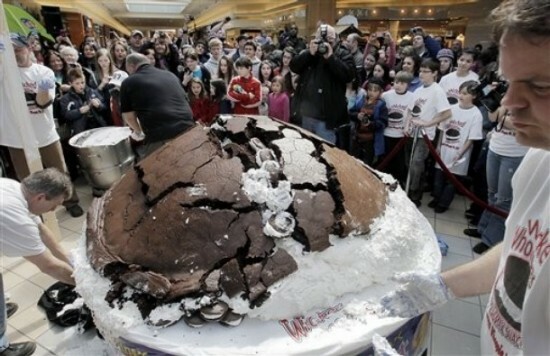 The event was also used as an opportunity to raise money for Maine troops serving abroad, so whoever wanted a slice of the world’s largest whoopie pie had to make a small donation. The raised funds will be used by Wicked Whoopies to pay shipping costs for the whoopie pies they plan to send to soldiers serving far from home.